Don't Miss Taste Washington's 20th Anniversary Celebration - Write for Wine: It's Wine O'Clock Somewhere!Write for Wine: It's Wine O'Clock Somewhere! Run, don’t walk, to get your tickets to Taste Washington, which we call “the Super Bowl of Wine Events” because it is the country’s largest single-region wine and food extravaganza. You don’t want to miss this explosion of tastes, fun and education on March 23-26 in Seattle. This year, Taste Washington celebrates its 20th anniversary with almost 300 wineries, more than 70 restaurants and top national chefs. In honor of this milestone, the 2017 expanded lineup offers four days packed with diverse activities. And for the first time ever, you can purchase The Connoisseur Festival Pass for four days of VIP access to signature events, with these extra benefits: jump the line at all major events, reserved seating at Alaska Mileage Plan Chef’s Stage and a gift bag with a bottle of Washington state wine, an autographed Cook + Cork Cookbook, a one-year subscription to Seattle Met magazine and a trio of El Gaucho spices. You’ll find “super-exclusive wine pours” at the VIP Red & White Party at AQUA by El Gaucho on Thursday, March 23 from 7p.m.-10 p.m. Taste Washington on the Farm gives you an opportunity to explore the northwest’s bounty, alongside farmers, chefs and winemakers on Friday, March 24 from 10 a.m.-3 p.m. New excursions in this year’s lineup include visits to Tahoma Farms and Ox Bow Farm & Conservation Center. The New Vintage with its trendy Rosé Lounge at the Four Seasons Seattle features music, more than 40 wineries and 11 chef stations on Friday, March 24 from 7 p.m.-10 p.m. 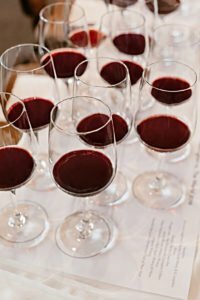 Informative and fun wine seminars, which include tastings and interactive panels, will be held on Saturday, March 25 and Sunday, March 26 from 10:30 a.m.-noon at the Four Seasons Seattle. New: Think about joining a Taste & Savor Tour through Pike Place Market on both Saturday and Sunday, at 8:30 a.m. and 9:30 a.m. 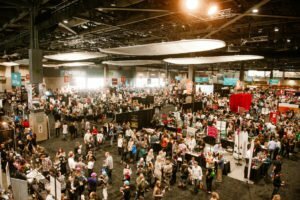 The Grand Tasting at CenturyLink Field Event Center will be held on both Saturday and Sunday, from 1 p.m.-5:30 p.m. (tasting hours have been extended this year). This entry was posted in Washington, Wine and tagged Taste Washington, Visit Seattle, Washington wine, Washington Wine Commission, Washington wineries, wine, wineries by Margot. Bookmark the permalink.